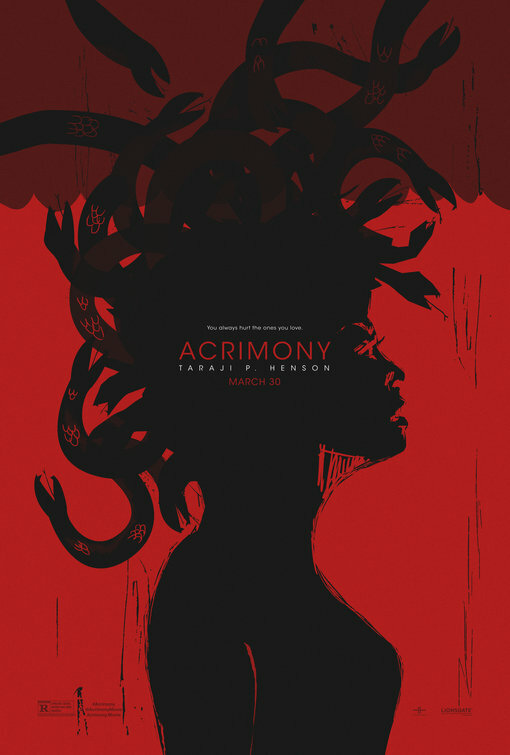 Acrimony has a couple really cool posters, but in my opinion this one is the best of them. Maybe I'm somewhat biased (red and black are my favourite colour combination), but the poster itself is just quite striking and says a lot about the film and the dangerous nature of its protagonist through its use of imagery. Plus, if Acrimony's Tomatometer is anything to go by, its posters are higher art than the film itself. This poster works on a few different levels, any one of which could be enough to get someone to want to see the film. First of all, it shows off the film's unique artstyle with each of its colourful characters on display. It also hints at Wes Anderson's particular "flat" style of directing, something which would excite anyone who had seen Fantastic Mr. Fox. Furthermore, it also shows the film's Japanese setting, not only with the title and sole human character, but with the way that the dogs are arranged vertically as if they were kanji. 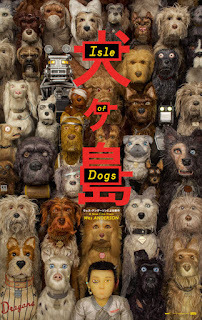 Character posters are an overdone trope with major releases these days (one that Isle of Dogs is not immune to), but it's nice to get a poster like this which shows off all of the characters in the film in an equal light, from the major to the minor, while also conveying that the film's style is as important as any singular element. This poster mainly makes the list because, I mean look at it, it's a gorgeous composition. The reflection in the water also has some thematic significance for the film, representing how the events of the film turn everything upside down. 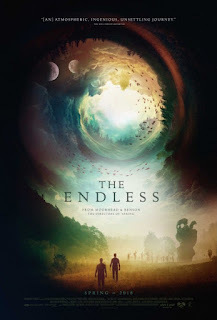 It's just a cool, visually striking poster, one that could easily be considered art unto itself. 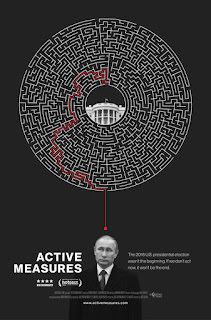 Visually, this isn't a particularly complex poster. Rather, this one succeeds for just how effectively it conveys the idea of the film through simple images. 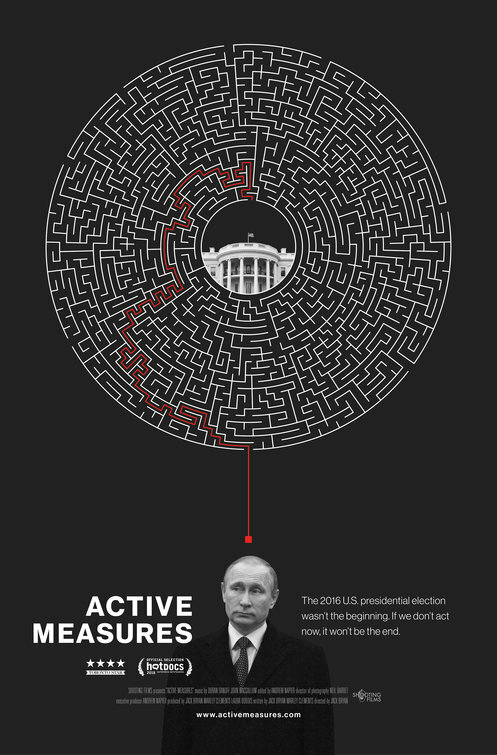 The sheer scale of the maze also goes to show that this isn't a simple affair, rather things have been progressing and going in Putin's favour for a long time to get them to the point where they could potentially have influence in the highest levels of the White House. A list of the best movie posters of the year is never complete without one good Drew Stuzan-style poster and I had a few candidates to go with this year. While Black Panther, Aquaman, Deadpool 2, Solo: A Star Wars Story and Avengers: Infinity War all had posters competing for a spot, I ultimately went with Ant-man and the Wasp. I just thought that the red, gold and white looked far more striking than any of its competitors. 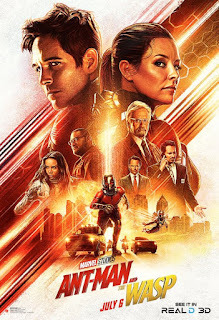 The equal prominence of Ant-man and Wasp as the co-leads also helped as it lent the poster just a bit more flavour to the composition, splitting the cast in half down the middle. Ultimately, it just makes the film look like a ton of fun, which is exactly what the Ant-man franchise is going for, moreso than any other Marvel franchise. This poster for The American Meme goes to show why taglines are so important. There are a few different posters for this documentary, but this one is definitely the most eye-catching of the bunch. 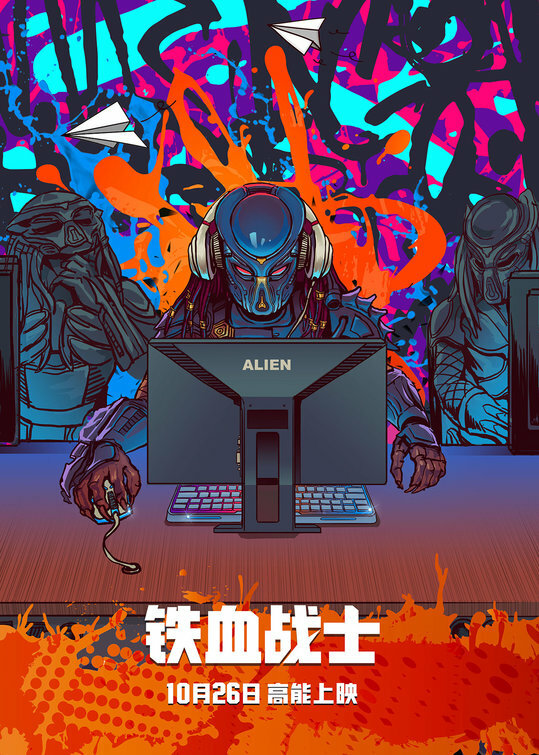 The tagline and image alone are enough to convey the idea that one should be cautious on social media, which is enough to make me intrigued on what sort of angle the filmmakers are going to take. In fact, of the films on this list that I haven't seen, this is one that I am definitely going to check out entirely because of the poster. I'm not sure what higher praise you could give a film poster than that. This is another one of those posters on this list which earns its place mostly by just being really cool and well-composed. It does get some points as well for managing to convey that this isn't "just another Spider-man movie", with its animation style, different costume for Miles Morales and the clothing he's wearing over the costume which helps convey his character. Oh, and to top it off, the poster just makes this film look like a ton of fun. 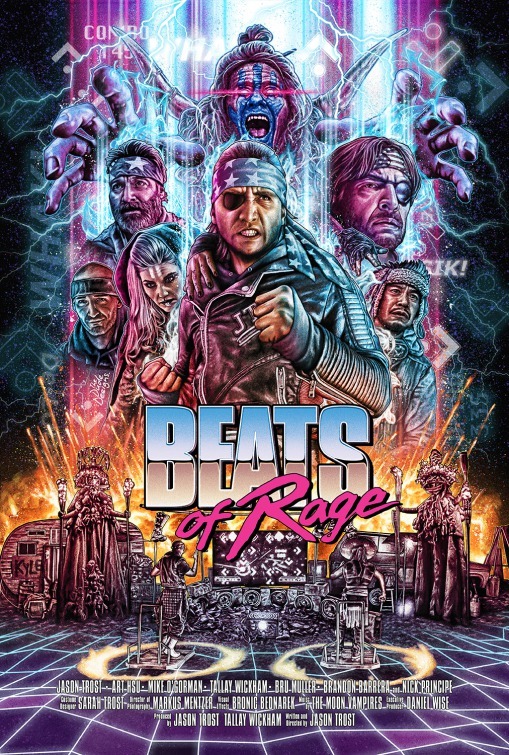 ...and speaking of fun, we've got Beats of Rage. 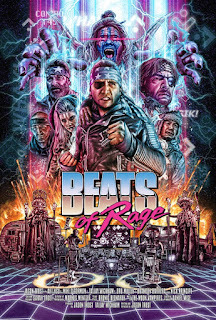 There were a couple films in 2018 with 80s arcade-inspired posters, but Beats of Rage takes the cake in my opinion. I have absolutely no idea what this film is about, but the poster is making me interested just due to how insane it looks. Is this like a mash-up between Mad Max and Dance Dance Revolution? I almost want to watch it to find out, but I feel like there's no way it can live up to the insanity in my head. 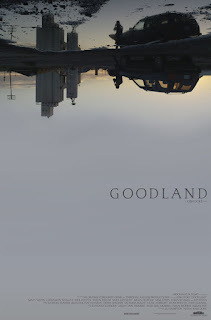 This is one gorgeously haunting poster. 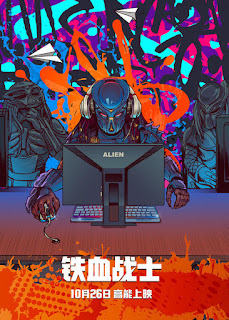 It almost looks like it could be a pretty cool desktop background, but the poster is also designed in such a way as to make it simultaneously unsettling to look at. The darkness encroaching throughout the image, the gigantic cosmic portal dwarfing the human characters and the humans all getting sucked into the vortex all make for a creepy image. This is another one of those posters that gets me interested on its own and having looked into the film more as a result, it sounds enthralling. The Meg had some of the funnest and most impressive marketing campaigns of the year, promising an entertaining popcorn film with a shark bigger than any other (whether the film delivered on that promise is up for debate). The posters helped to build up that hype, that this was a shark movie for the modern blockbuster age. 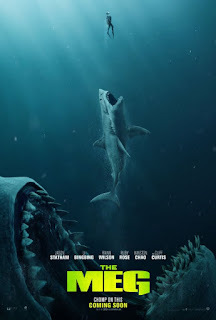 I liked this poster the most, as it shows off the scale along with some humour in the process, while also riffing on Jaws. There were quite a few cool posters for Infinity War (even the obligatory, normally-boring character posters were pretty great), but this series of five posters were by far the best and most stylish. Thanos takes the center poster, but the two posters to either side of him feature stylized versions of all of the major characters in Infinity War. It just goes to show just how epically unprecedented the scale of this film is, while also just looking super cool in its own right. 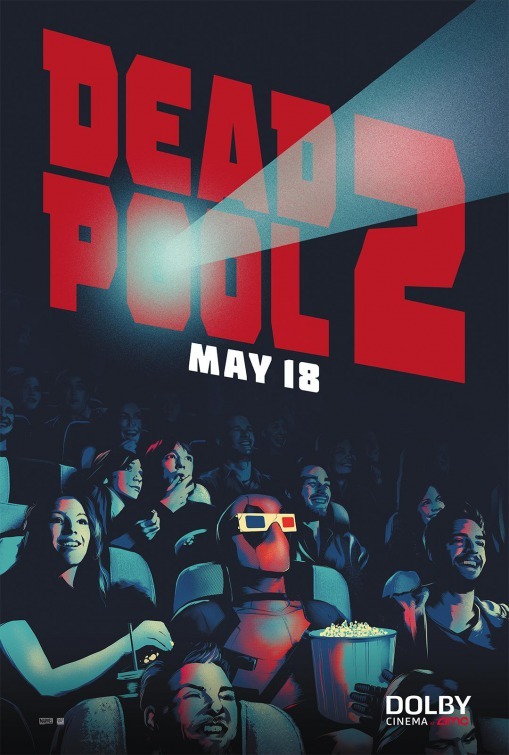 Unsurprisingly, Deadpool 2 had a slew of great posters to choose from, but this one was definitely my favourite. For one thing, it just looks really stylish and eye-catching. Most importantly though, the meta aspect of it is just pure Deadpool, made even better with all the random extras in the audience super excited to see the movie and Deadpool's own enthralled expression. The marketing really shows off the character's unique sense of humour and why this isn't "just another superhero movie". Man, it was super hard to pick between the top 3 entries on this list, they were all super close. Perhaps the most impressive thing about this poster is that it's for freaking Truth or Dare. Look at that thing, it makes you flinch and promises a far more brutal film than what you would be actually getting into. Furthermore, the neon green and pink style of the poster is really interesting and eye-catching. 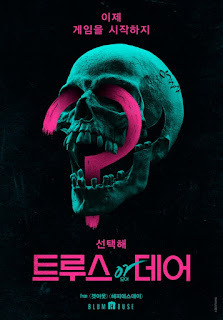 If there's one thing I don't like about this poster, it's the stupid "Truth or Dare" grin on the corners of the skull's face, but that's more of a failing of the people who made this movie rather than the poster itself. 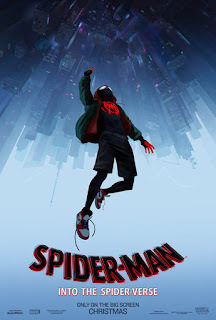 I really wish that this was a poster for a better movie, it it does go to show that sometimes the marketing can transcend the film it's trying to sell. Everything about this poster is so unsettling, from the sleeping victim to the masked killer, the washed out colours, the incongruous domestic setting, the voyeuristic framing, even the title which contextualizes everything and makes it even creepier. This is another one of those films that I am definitely going to check out this year based on nothing more than this extremely unsettling poster. I mean, if the poster is this artfully disturbing, you'd hope that the film itself can capture some of that energy right? I look forward to finding out! And now for our winner of the 2018 IC2S Movie Poster awards... Drum roll please! OH GOD. If ever there was a poster that conveyed exactly what the film was about, this has to be up there among the most evocative. Like... how. How do you manage to make that climb? Can you even take breaks on the way up? How does he survive? Good God, how high is that cliff!? 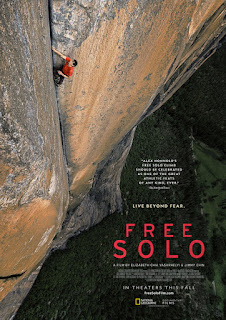 Has a poster alone ever given someone vertigo before? I have so many questions because of this poster and the only way I can get my answers in a satisfactory manner is to watch Free Solo. Again, there is absolutely no greater praise you can give to a poster than that and I have seen few posters that have pulled that off greater than this.